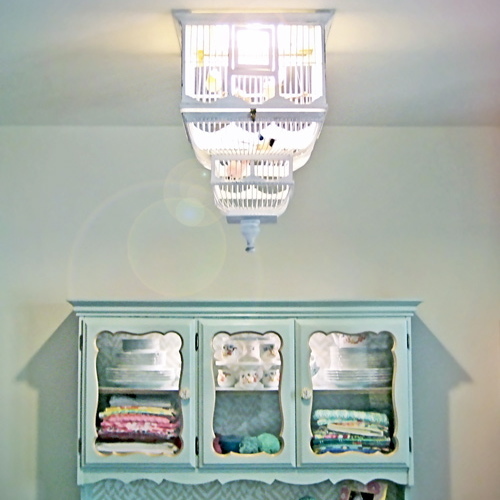 Two years ago, I wrote a “Trend Alert” post on basket lighting and cage lighting. (You can see that post here.) 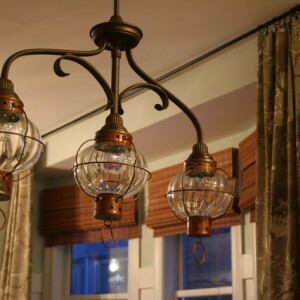 And in that post I included this fabulous 5 basket chandelier which garnered the most attention. 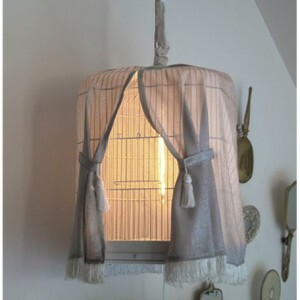 I found the image in an online wholesale catalog and several of you begged me to find out a retailer that sold the light. I even called the company and spoke with a representative that told me I would just have to search for shops that carried their products and that she couldn’t help me beyond that. Uh…okay. Several of you suggested that such a light could easily be diy’ed. Now, let’s fast forward to the present! I’m not sure if Brooke ever saw the inspiration photo before, but regardless she has created a 5 light basket chandelier for her kitchen that is gorgeous! And she has shared the step-by-step tutorial with all of us so that we can create your own. 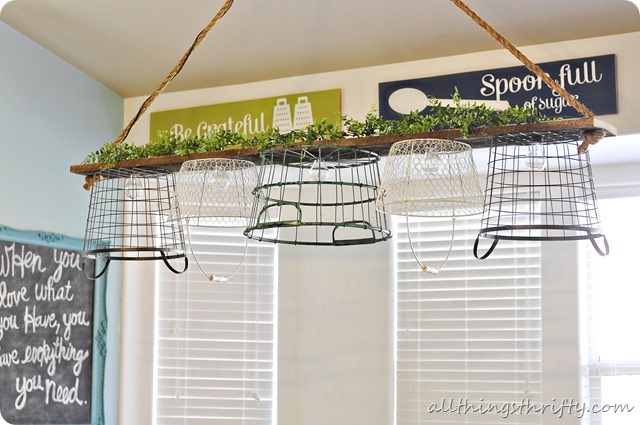 Head on over to All Things Thrifty to read Brooke’s Wire Basket Chandelier tutorial. and may come back from now on. I want to encourage you to definitely continue your great posts, have a nice holikday weekend! Thanks for the shout out Beth! I never saw your inspiration post, but I wish I would have! HA! That would have saved me two years of trying to decide which light I wanted to make! Love ya girlie! I’m honored to have been featured on your amazing site! You’re welcome Brooke! Did you get any traffic from it? I hope so!! I saw the original light fixture in “The Inside Story” in Madison, MS a few months ago, in case anyone wants to contact them. It is gorgeous!